Comments: Side by side, wall on the outside, and wall on the inside, and cars always in a drift. That was the dirt days of Flemington. Here Stan Ploski in the Trenton Mack #74 pulls along side of first Late Model stand out and then good running Modified driver Matt Slowinski. 05/31/03 Kevin B. This is a perfect example of racing at Flemington. To me this beautiful Trenton Mack-MUDBUS is all that embodies the 80s era. As for Matt Slowinski, what can we say besides we miss your talents and style! 06/01/03 Brian Loutrel This was the version of the Trenton Mack #74 Troyer car that Stan drove in 1985 and 1986. 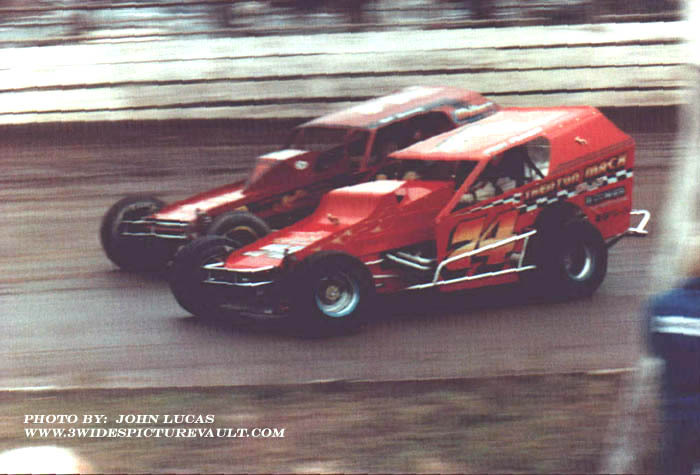 The body was badly damaged in a first turn pileup in June 1986 and the car was totalled in July 1986 during the triple 20's features when Stan flipped it between the third and fourth turns. 06/01/03 Todd L Troyer Mudd Buss the chassis of choice in the mid 80's I see Matt Slowinski alongside the Bulldog Express I seem to remember Matts Custom Automotive (Matt Slowinski's Business) built some motors for those in the racing world. 06/08/03 Jeff McClung This is one awesome picture, the Trenton Mack car is immaculate as ever, but this Matt Slowinski car was a Show Car chassis and ran very well, if he only had some real backing he would have been a star with this outfit. One of those great drivers that never really got the recognition they deserved. 08/17/06 Ed I wonder if anyone knows how and what Matt is doing these days.... My nephew Kent lived near Matt in Long Valley, (helped work on the cars at night) and told me that Matt and his wife where in a car accident a year or two after they got married. I would love to see him back in a car because Jeff is right, although he had good people working on his cars, he could have been great with a little more backing. 05.11.09 Eric Matt's car was not a Show car but a Troyer Copy that was built by then Frank Cozze Crew Chief Fran Callery(s). Matt built the body and engine. The Show car came the next year (86). 02.05.14 Hal Emrich Matt was still building engines in 2013….built the 62 327/340 for my Corvette last year.